Hey, Folks! We supply our customers with nutrient-rich pasture-raised eggs that have white shells, and there has been some talk about the difference between brown eggs and white eggs. Are brown eggs healthier than white eggs? The answer is… no. Here’s why. If the earlobe is white/blue, the hens will lay white/light colored eggs. If the earlobe is red, the eggs will be brown. We decided to raise Brown Leghorn hens at Rafter W Ranch. These are an elegant and slender poultry variety that originated in ancient Tuscany, Italy. They still retain much of their rustic instincts, so they function well in our rural setting; being able to fly and escape predators more easily than fatter American breeds. Their natural-toned brown feathers help them to blend into the landscape, drawing minimal attention from hawks, coyotes, and other prey animals. Leghorns came to America in the 1800’s and swept the nation with their egg-laying efficiency. Mega-farms have taken advantage of the fantastic laying capabilities of this breed, and raise millions upon millions of White Leghorn hens in confined, light/temperature controlled warehouses to mass-produce eggs until their age slows down the production; then they are disposed of, and a new batch takes their place. In Mega-farms, their diets are exclusively grain/soy based and questionable, hens are painfully debeaked at a young age, and they are packed into damaging wire cages to live their short unhappy lives as layer hens; trying to meet a demand that even the best-of-the-best can’t live up to. The result is mass-produced cartons of bright white eggs that look great on the grocery store shelf, but the nutritional and ethical value is downright disturbing. 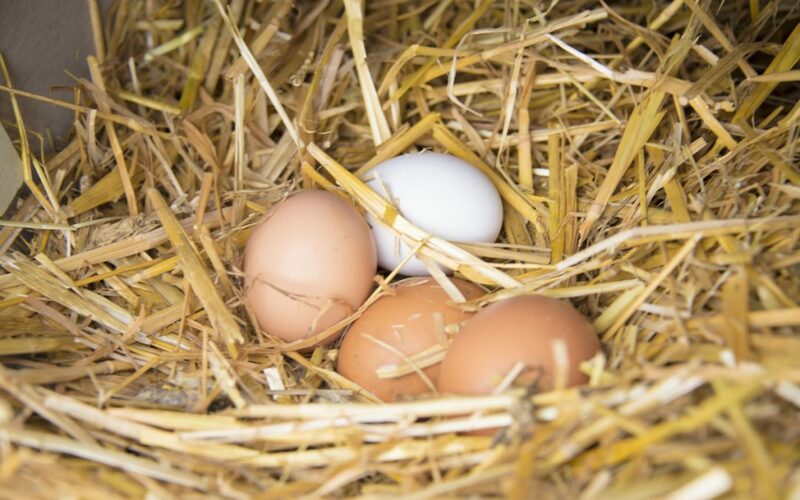 Whatever color the shell of an egg is, the quality of the egg is far superior when the hens are able to forage in the pasture; it significantly raises the amount of Omega-3s in the yolk, and jumps the Vitamin E up 200%! Our hens are valued, and they know it! We allow them to forage freely on the ranch, not only because it makes healthier eggs, but it also makes happier hens! Check out our online store for some fresh nutrient-rich white eggs raised right here at Rafter W Ranch; you can taste the difference!